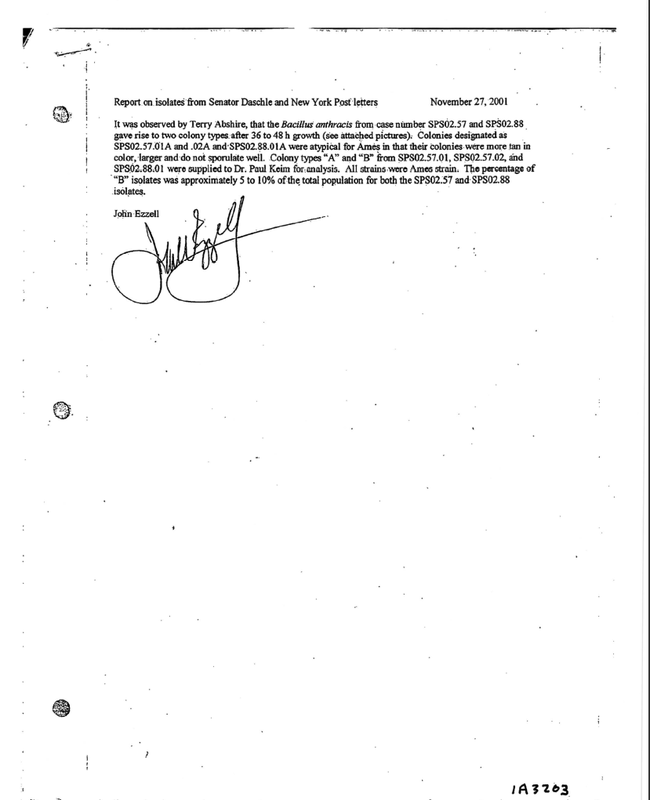 Daschle anthrax powder « CASE CLOSED … what really happened in the 2001 anthrax attacks? The FBI’s posted FOIA documents give a fascinating insight into why the alarm bells went off inside the Beltway when the extraordinary properties of the Daschle anthrax powder were discovered. Now, for the first time, we are actually able to see the data behind these properties. The conclusion is that it is beyond the realms of possibility that Ivins could have created a powder that exhibted these numerical parameters all on his own, covertly, having never made a dry powder before in his life. Numbers cannot be argued with (which is why the FBI don’t reveal the % silicon they found in the Daschle, New York Post or Brokaw powders. Thus far they have only admitted to finding an enormous 1.45% silicon in the Leahy powder). 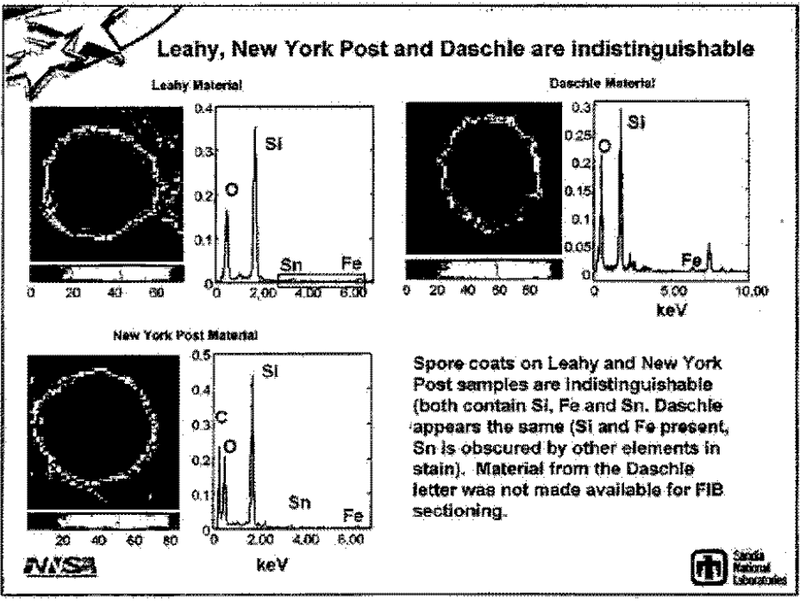 After Bruce Ivins showed that the Daschle powder dispersed into single spores upon plating (>10^12 colony forming units per gram), that was alarming enough. But then the government quickly gathered a collection of dry spore simulants they had availiable in house. These dry spore simulants are ALWAYS weaponized with silica – that’s standard procedure. 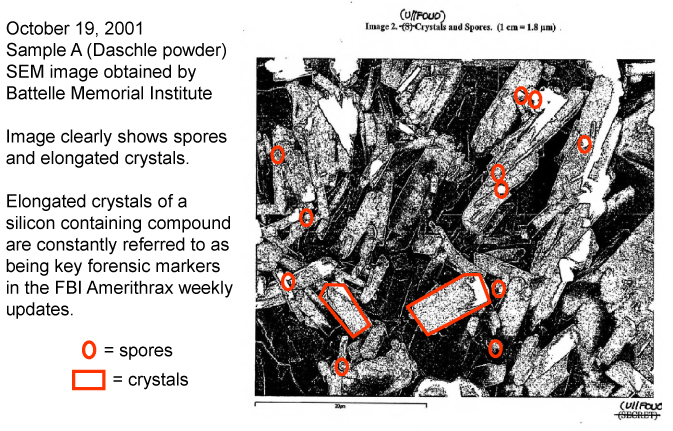 When Bruce Ivins plated these, the alarm bells really went off – the Daschle powder dispersed into single spores at least 2 orders of magnitude more effectively than the weaponized simulants – in most cases much more than 2 orders of magnitude more. And we are supposed to believe he made a product orders of magnitude more effective than the simulants all on his own covertly when he had never made a weaponized dry powder preparation before in his life? The numbers don’t lie – and the science doesn’t lie if you understand it. I received the REDACTED samples (in small cryotubes in a ziplock bag) from REDACTED on the afternoon of 24 October, 2001. The tubes were weighed and estimated to contain about REDACTED of material each. To each tube REDACTED of sterile water for injenction was added to the material. After thorough mixing, the material was added to a second tube. The original tube was disinfected with bleach, dried and weighed. The net weight of the granular material was then determined and listed above. Ten fold dilutions of the suspensions were plated out onto TSA, then incubated overnight. Plate counts were made and the following concentrations were determined for the material. Visual inspection of suspensions of the material under phase contrast microscopy demonstrated very poor preparations of spores. The preparations were all highly granular and did not easily go into suspension. If these are preparations of bacterial spores they are all very poor preparations. The CFU per gram are very low. This preparation is less pure than the SPS02.88.01 preparation [Daschle powder] preparation examined on October 23, 2001 which had a count of 1.3X10^11 CFU per gram. This preparation is much less pure than the SPS02.57.03 [Daschle powder] preparation examined on October 17, 2001, which had a count of 2.1×10^12 per gram.